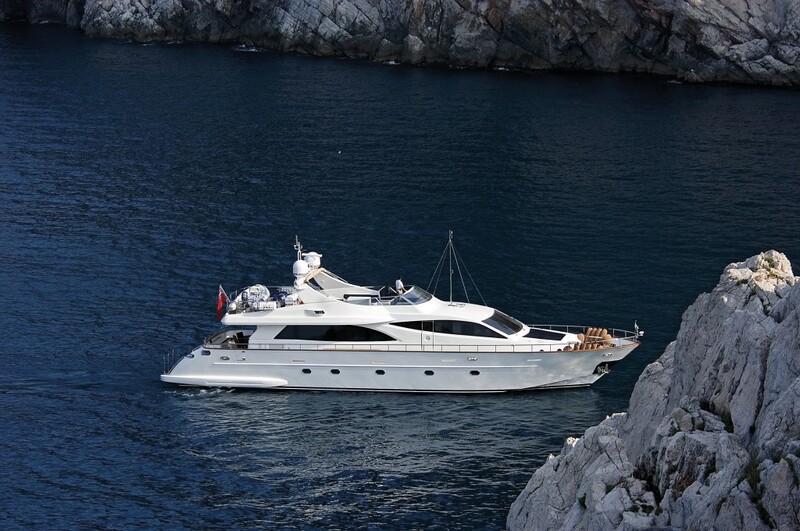 Luxury charter motor yacht LEI MAONIA is an 88ft Falcon Yacht built in 2008. 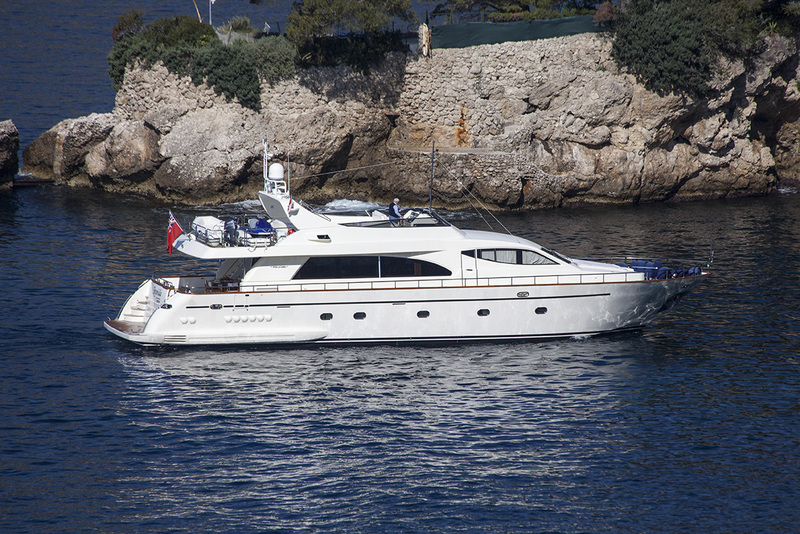 She combines high performance cruising of 22 – 26 knots with a comfortable interior and efficient layout. 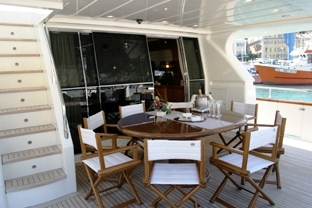 LEI MAONIA can accommodate 8 guests and is based in Nice on the French Riviera year round. 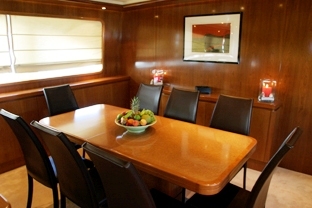 Motor yacht LEI MAONIA offers a combination of open and covered deck spaces. 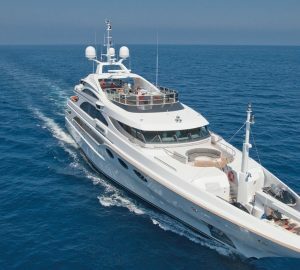 Her spacious deck areas provide ample room for sunbathing, to spend time taking in the panoramic Mediterranean views or to eat el fresco under the shade of the bimimi. 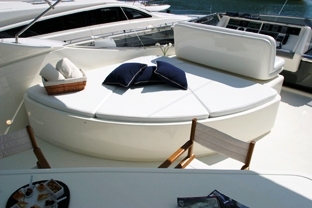 Along with the sunpads forward of the bridge, there is plenty of space for guests to soak up the sun. 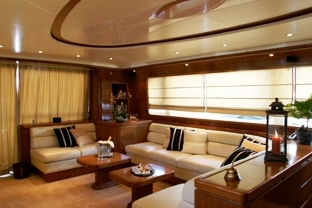 The external layout is enhanced by the yachts great internal space perfect for formal entertaining or relaxation. 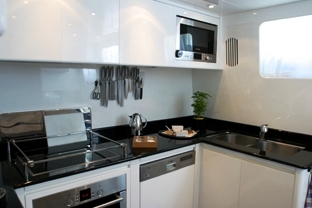 Her interior is smart and minimal yet welcoming. 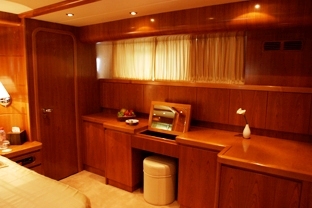 LEI MAONIA is ideal for friends and family with four comfortable and well equipped cabins, each fitted with an ensuite bathroom and varying entertainment facilities. 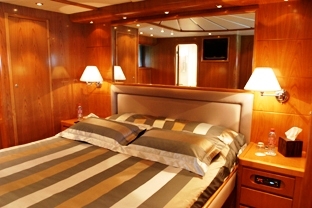 Falcon Motor yacht LEI MAONIA offers accommodation for eight guests in four staterooms, each with ensuite facilities. 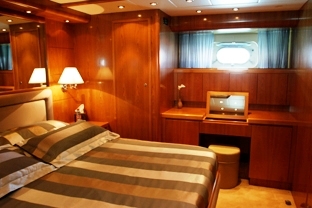 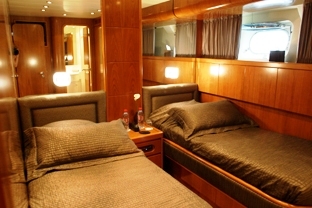 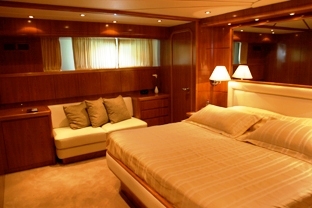 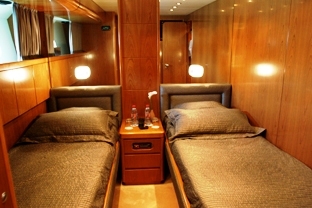 The Master stateroom, one double cabin and two twins are located on the lower deck. 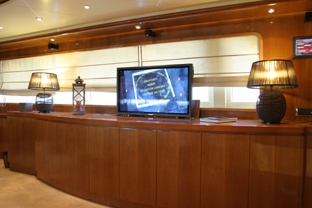 The cabins are equipped with a TV with DVD multizone and a Sony CD radio player. 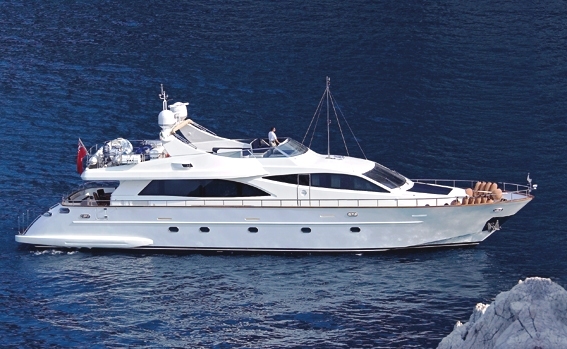 Motor Yacht LEI MAONIA also offers a range of water toys to keep everyone onboard busy. 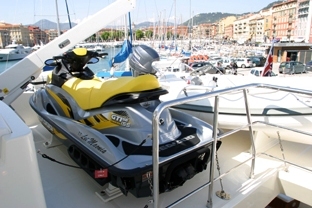 Tenders & Toys Include a Tender Novamarine 4,20m – 40hp 4T, Sea doo 3 places 155 GTISE, Water skis Mono and Bi, Wake board, Doughnuts, and Snorkeling Gear. 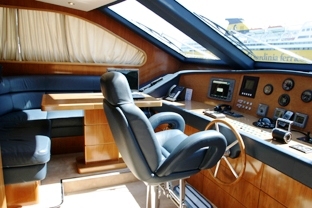 Communications include -1 VHF DSC Sailor, -1 VHF, GMDSS Sailor, -1 SSB/HF Sailor GMDSS, -Panasonic telephone Central unit working also as interphone. 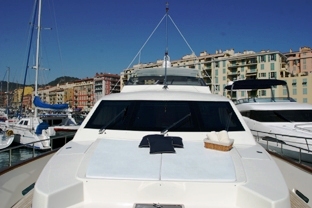 -WIFI connection on board, only in French Riviera Harbours, Audio Visual Equipment and Deck Facilities: TV with DVD multizone in Salon and Guest cabins, Canal Plus receiver in Salon, Sony CD radio player in each guest cabin, Audio Bose System with 4 independant zones (Salon, aft deck, fly bridge, foredeck) Sony CD player on Fly bridge and Wifi.